Driving south on I-71 Wednesday, I was mesmerized by a deep purple veil creeping across fields like smoke on the water. The purple haze, all in my eyes, made me wanna drive 'til I ran out of highway into the purple sky. The annual bloom of Purple Deadnettle (Lamium purpureum) that is just getting underway in farm fields flanking Ohio's southern highways was responsible for my nostalgic pop culture smash-up. Even this weed's name would be great for a rock band; think Deep Purple meets deadheads. 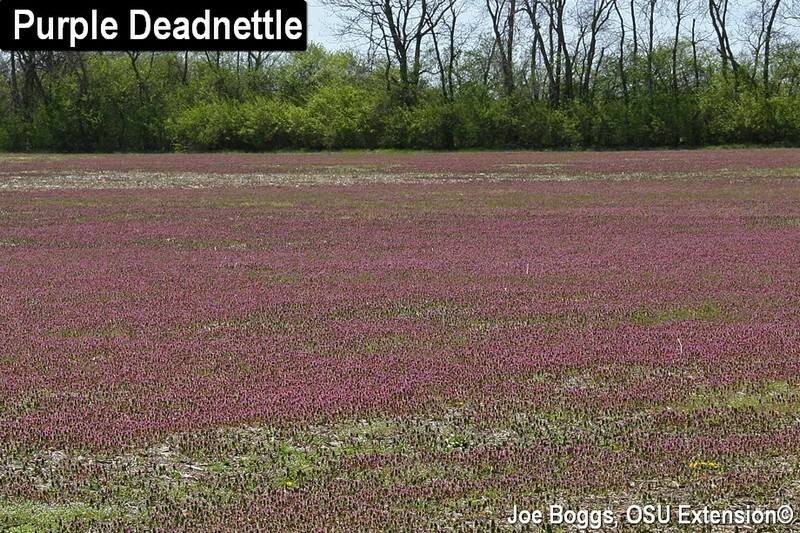 Purple deadnettle is a winter annual meaning that seeds germinate in late summer to early fall. Members of this sneaky group of weeds grow throughout the winter and sing their flower song in the spring. This isn't a problem for farmers because winter annuals are easily plowed under in the spring so they don't compete with summer annual crops. In fact, in some ways, they act like winter cover crops. However, winter annuals can create headaches for landscape and turfgrass managers. Since preemergent herbicides are typically used to target the spring germinating seeds of summer annuals (e.g. crabgrass), winter annuals such as deadnettle can escape to reappear as harbingers of spring each year. The beautiful purple display beginning to adorn Ohio farm fields is produced by both the flowers and new leaves of purple deadnettle. The pitcher-shaped flowers range in color from pink to deep purple. Older leaves are green to purplish-green while new leaves may be a deep, reddish-purple. Henbit (L. amplexicaule) is sometimes mistaken for purple deadnettle, and vice versa. Both are winter annuals and since both are members of the mint family (Lamiaceae); they have square stems. However, henbit leaves are scalloped and evenly spaced along the stem; new leaves do not have a purple hue. Plants tend to grow low to the ground and are seldom so prolific they cover large expanses of open ground. The leaves of purple deadnettle are triangular to heart-shape and serrated along the margins. They arise opposite of one another along the stem and new leaves may be deep purple. Deadnettle plants may rise to height of 16 - 18" and they commonly carpet open ground such flower beds, openings in weakened turfgrass, and of course farm fields. Purple deadnettle can be controlled by hand weeding and cultivation. A post-emergent broadleaf herbicide can be applied in early spring to control the blooming plant, but a pre-emergent herbicide will need to be applied in late summer to control the germinating seeds of this winter annual. If you do choose to use an herbicide, be sure to follow and read all label directions.